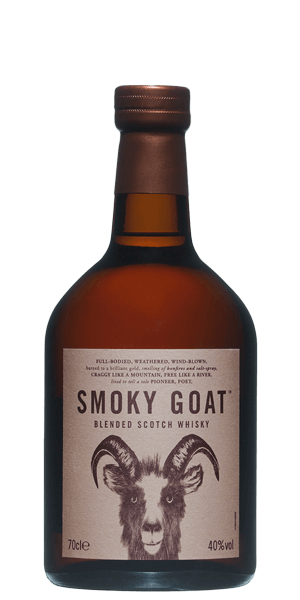 Smoky Goat—a blended Scotch Whisky—is the first of the three unconventional expressions they’ve released so far, the other two being Boxing Hares and Huxley. It’s named after the wild goats native to Scotland. It embodies the remote and rugged nature of the land and the tough, playful character of its goats (and people some would say). It’s a blend of 3 unique Whisky styles: sweet grain, body & character of a Highlander and smoke for which the Islay is famed for. Craig Wallace, it’s creator, envisioned the smokiest of blends finely balanced with a tinge of irresistible sweetness. It’s handmade in small batches with three different cask types: refill, rejuvenated and first fill bourbon casks. It’s advised you serve it on the rocks so the ice slowly unleashes the smoky flavor. Our take? Smoky Goat is a most deserving homage to Scotland’s finest flavors. What does Smoky Goat taste like? The Flavor Spiral™ shows the most common flavors that you'll taste in Smoky Goat and gives you a chance to have a taste of it before actually tasting it. Toffee, butterscotch, vanilla sweetness, Highland malt and a whiff of the bonfire embers; smoke intensifies with the addition of water. Thick body, vanilla, treacle toffee and butterscotch sweetness, smoke. Smoky, caramel, vanilla sweetness, butterscotch, bonfire, sweet, grain, spicy, oak. Smokey with a lingering warmth in the back of the throat. This drinks similar to Johnnie Walker Green with perhaps a deeper hint of oak. If you poured printing solvents into a bonfire, and strained coffee through the ashen remnants, that’s what this might taste like. Did not care for. Very nice! Smooth and delicious. Smoky with a nice kick. Very smooth. Smoky, spicy and with a sweet note that partially covers the alcohol content. Not exactly remarkable, but very good for this price. Very smooth. Smoky and spicy, with a sweet note that partially covers the alcohol content. Not exactly remarkable, but very good for this price. Not as smoky as I thought it would be, but still an enjoyable whisky. The smell was fruity and sweet, but then tasted it and felt a bit more caramel on the palate and also toffee. Little bit of a bitter taste at the end, but still enjoyed this! Very easy drinking spirit. Not overly smoked and a subtle sweetness that balances nicely with the slight bitterness. Excellent at this price. Works very well at room temperature in glas with nothing. I will buy another shortly. Cheers. Absolute beaut of a blended. Not usually a fan of blended because I'm one of those single malt only guys. But this is good whiskers. And cheap as hell. Get it. Pleasantly sweet aroma - mix of vanilla and caramel, touch of smoke. Nice smoke in the flavor as well, though it doesn't compare in intensity to the smoke in a typical Islay single malt. Still very enjoyable - basically a sweet, subdued Islay where the flavor combination works well. Very subdued smoke. Bland vanilla and clarified butter with a sprinkle of pepper at the end. Good, but too subdued to be great. What can I compare this to hmmmm, let's say a less intense version of talisker 10yr which for those that haven't tried that tastes of that smell of smoke while not the most appetising sounding drink I will say it's cheap and some people like that sort of thing. If you can't tell already from this lacklustre review I can't think of anything to say, you know what the drink is meh there you go meh. I generally prefer my whisky smoky, peaty, briny, some true grit on it. As with all things with a description in the title, this is not as smoky as it would like to be. My fav out of the sample Pack.